The Sennheiser EW 500 G3 Receiver is a professional receiver from the new Sennheiser G3 line. It boasts a high number of presets possible per frequency bank (32), making setup of many wireless systems quick and easy. The Sennheiser EW 500 G3 receiver houses an Ethernet port which allows for computer control and monitoring with a machine running Sennheiser’s Wireless System Manager software. The large graphic display provides essential information at a glance and the one-touch sync function automatically links up a G3 transmitter with this receiver. 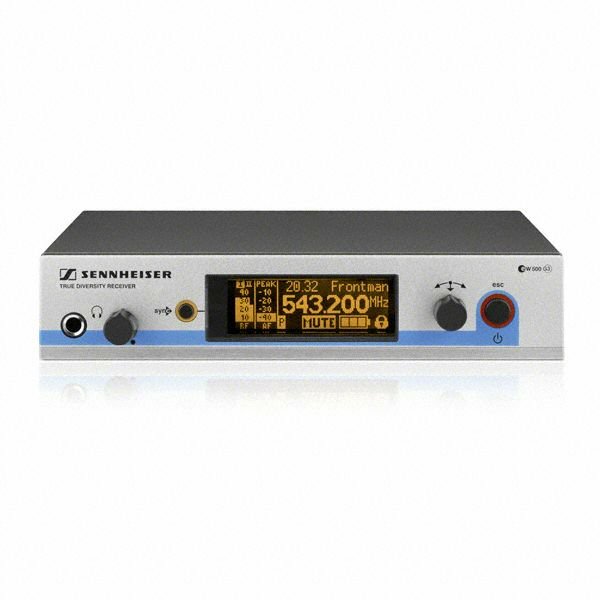 Production Hire own a state of the art Sennheiser EW 500 G3 Receiver for dry hire to support your live music event. Call or contact us for your free no obligation quote regarding Sennheiser EW 500 G3 Receiver dry hire. One of the Production Hire team will be happy to help.